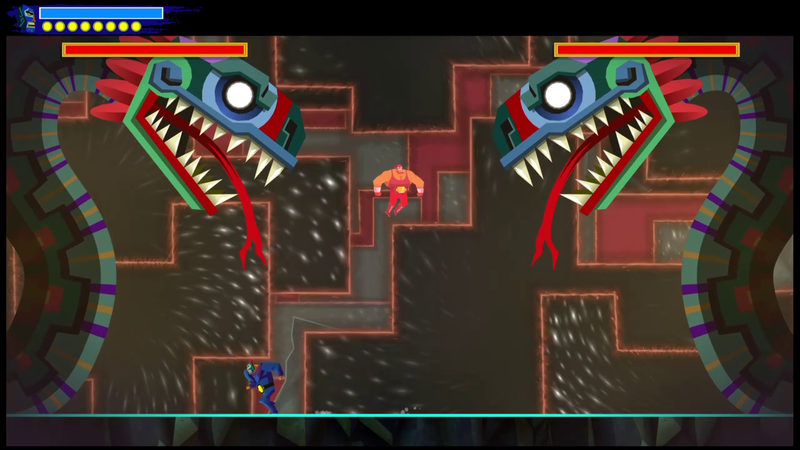 Having trouble with Guacamelee 2's final boss? Shacknews is here to help you save the Mexiverse. There's a bad, bad man threatening the entire Mexiverse. That someone is Salvador. Once he has the three relics, he's able to eat the Sacred Guacamole and become practicaly unstoppable. It's up to Juan Aguacate to take this bruiser down a notch. Need an idea of how to go about doing that? 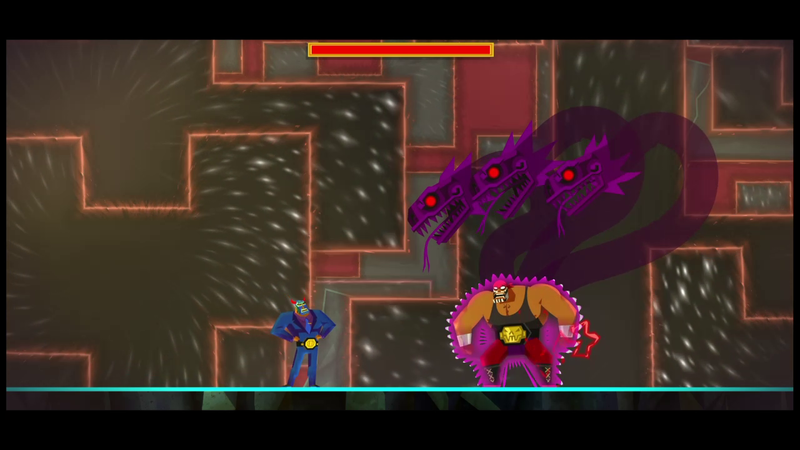 Shacknews is here to help with Guacamelee 2's final boss battle. By this point, you should have maxed out your Chamoya Fitness skill tree and unlocked Mindful Meditation, otherwise this will be a very painful battle. You're going to want to roll out of the way or duck under the snake lasers and hold Down to recharge any lost health or stamina. Use chain combinations of KO Headbutt/Dash Punch, Rooster Uppercut, and Frog Slam to maximize your damage output. Focus on a single target, because the battle gets much easier once you're down to a single snake. Once you're down to a single snake, Salvador will start bringing missiles down to up the degree of difficulty a tad. Avoid the missiles and keep up your barrage against the last target. Once both snakes are down, Salvador comes out to finish you off himself. Salvador will unleash his full power and will now be flanked by three serpents popping out of his back. He'll brag about how no "MAN" can break through his shield, throwing all sense of subtlety out the window. Sure enough, this is a sign to go into chicken form and use your Pollo Shot to break through Salvador's purple shield. He'll then switch to an orange shield and come at you again, so use your Pollo Slide to make him vulnerable. Salvador will gracefully leap and drop a flying elbow, which will travel a good distance. The snakes will strike upon landing, covering more ground. Roll out of the way of this. Salvador will roll around and when he glows, he'll go for a full-screen charge. Jump out of the way of this. When Salvador jumps and stays suspended in mid-air, his snakes will strike down on the ground underneath him. Roll out of the way of this and take the opening to heal with Mindful Meditation. To make things a little tougher, Salvador will bounce back and forth between dimensions, so be sure to keep up and use Dimension Swap when necessary. He'll also refresh his shields with different colors, so use whichever Luchador/chicken ability indicated to break his defenses. If you've played the game to this point, you should know what the color codes are, but for those still unfamiliar, it's red for Rooster Uppercut, blue for Dash Punch, green for Frog Slam, gold for KO Headbutt, purple for Pollo Shot, and orange for Pollo Slide. Watch out for the aforementioned attacks and let fly with combos. There's no real way to stun Salvador for long, so roll with the punches and heal whenever necessary. 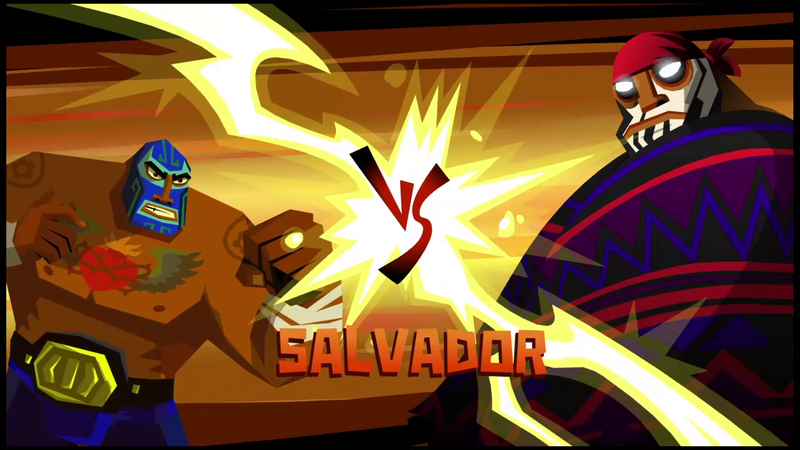 It won't be long before Salvador goes down for the three count and the Mexiverse is saved. Enjoy the ending and good luck with Hard difficulty!